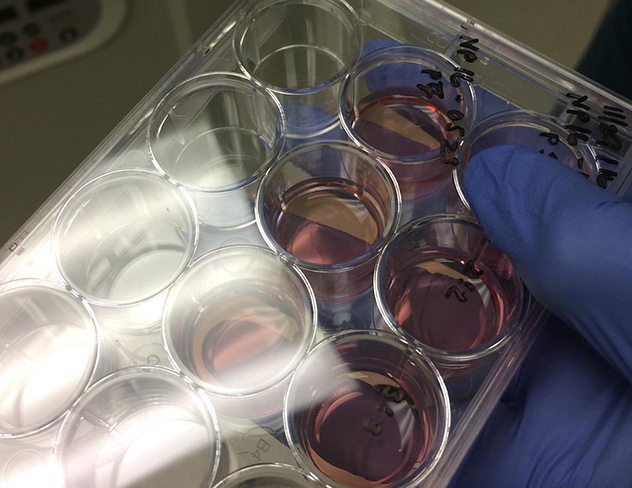 Stem cell cultures prepared in Jessica Young's Alzheimer's disease research lab. Researchers found that a compound that enhances the shuttling of proteins within cells reduced the production of forerunners of two proteins implicated in brain cell death. Damage to, and destruction of, brain cells underlies a common form of dementia. Alzheimer's affects more than 5 million Americans. It causes loss of memory, thinking, way-finding and reasoning skills, and other debilitating problems. The disease tends to get worse with time. Aging is a major risk factor. Brain tissue from people with Alzheimer's disease shows clumping of two types of proteins. One, amyloid beta, accumulates outside of brain cells; the other, called Tau protein, collects within the cells. Both of these toxic proteins are thought to cause the brain-cell death seen in Alzheimer's. Recent research suggests that these proteins accumulate because of a defect in the system that ferries proteins within the cell. The proteins are shipped in membrane-bound packages, called endosomes. The system that shuttles them around the cell is the endosomal network. For proteins to be properly processed, eliminated or recycled, this system must function correctly. In the new study reported this week, the UW Medicine-led research team used human brain cells created from stem cells. The results showed that a compound that boosts the function of the endosomal network significantly cuts the production of both amyloid beta and a precursor of the Tau protein. The study will be published online March 1st in the journal Stem Cell Reports. The lead author is Jessica Young, assistant professor of pathology at the UW School of Medicine in Seattle. She is a member of the UW Institute for Stem Cell and Regenerative Medicine. She noted that the findings suggest that targeting defects in the endosomal network, through the discovery of drugs or other therapeutics, such as gene therapy, may be a promising strategy against Alzheimer's disease. In the study, Young and her colleagues obtained skin cells from patients with Alzheimer's disease and from patients who had no signs of dementia. Because all of a person's cells share the same genome, the skin cells from patients with Alzheimer's would contain the same genetic mutations that affect the patients' brain cells. The researchers then "reset" the skin cells by reprogramming them to act as stem cells. Such cells, called induced pluripotent stem cells, are capable of developing into any cell type. Young and her colleagues were thereby able to create neurons that had the same genetic makeup as patients from whom they had collected skin samples. The lab-grown cells from the Alzheimer's patients would have the same tendency to generate the excess amount of amyloid beta and the Tau protein precursor that is seen in the brains cells of people with the disorder. This made it possible for the researchers to measure amyloid beta and Tau protein production in these stem cell-derived neurons. The researchers wanted to see if enhancing the function of the endosomal network, in a laboratory setting, would affect amyloid beta and Tau protein in these human cells. The scientists tested a compound that had been shown in animal studies to stabilize and boost the function of a protein assembly called the retromer. The retromer is a key player in directing how the endosomal "packages" are shuttled about in the endosomal network to be delivered to the right destination. "The network can be thought of as a kind of United Parcel Service with the retromer proteins serving as package labels," Young said. The researchers found that the compound, called R33, did enhance the function of the retromer. This led to considerable reduction in the production of both the amyloid beta and the form of tau protein that readily aggregates, phosphorylated-Tau. The researchers also used the cells to test the hypothesis that production of amyloid beta drives the production of phosphorylated-Tau. The accumulation of the two proteins seems to be tightly linked. The scientists employed the gene editing tool CRISPR to create cells that did not make the necessary precursor of amyloid beta. Nevertheless, the R33 compound was still efficient at lowering phosphor-Tau. That result indicates that this pathway may work without the assistance of amyloid beta. "The findings suggest that something upstream is affecting the production of amyloid beta and phosphorylated-Tau independently," Young said. "So one thing we're going to work on going forward will be using these cell lines to identify what this upstream defect might be and whether it, too, could be a target for new therapeutics to treat Alzheimer's." Young noted that collaboration among scientists is what is moving the field of Alzheimer's disease research forward. Among those collaborating with the UW Medicine team on this project were Lawrence S.B. Goldstein at the University of California, San Diego, in whose laboratory the initial studies were done and where the Alzheimer's patients' cells and the control skin cells and fibroblasts were generated; and Scott Small at Columbia University and Gregory Petsko at Weill Cornell Medical College, both of whom pioneered initial work on the R33 molecule.